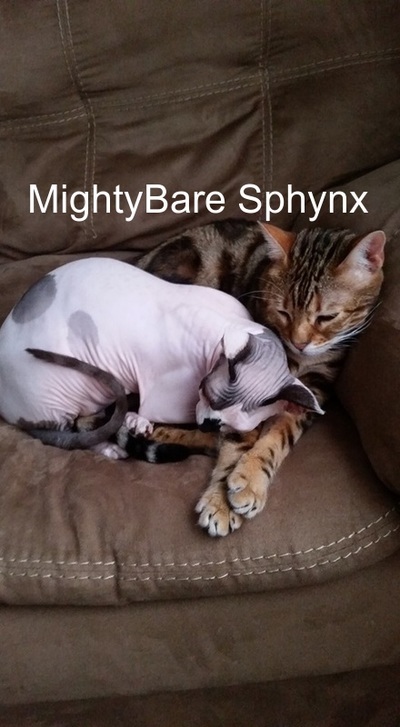 ﻿Welcome to Mighty Bare Sphynx! Welcome to Mighty Bare Sphynx! We are a small cattery breeding purebred Sphynx cats in Washington State! We are also on FB and IG! Thank you for visiting our page! Feel free to look around as we have a lot of information available! ​We of course, share our home with Bengal pets but no longer breed them. We are still involved in Bengal Cats and can recommend great breeders if necessary. 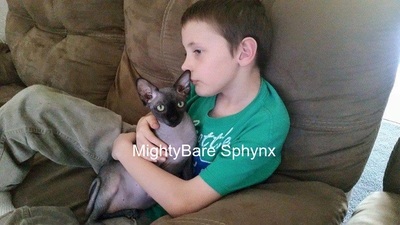 A few years ago, we fell in love with a friend's litter of little "naked alien cats" and our sons have always loved visiting the Canadian Sphynx booths at cat shows. We brought home a female kitten as a pet initially. 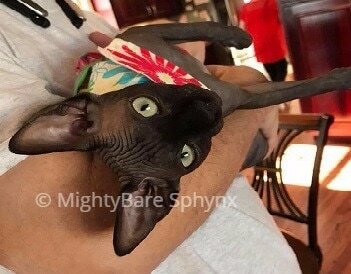 After doing a lot of research, attending shows (on the naked side), and having necessary genetic health screening done (PKD1, PRA, CMS, HCM, FELV/FIV) we decided to have a Sphynx litter.... Needless to say, we were hooked. ​We now have a small program of Canadian Sphynx cats and hope to breed amazingly sweet, awesomely healthy, stunningly gorgeous and surprisingly unique kittens for people to love. Every adult cat here is screened YEARLY for HCM and pet kittens are altered before they leave our house. We also have genetic screenings done through UC Davis or Optimal Selection- this may include PKD, PRA, Blood Typing, Color Panel, Sphynx/Devon Coat panel. We have two children and of course a clowder of cats that help us in raising each litter with lots of love and attention. We do not have kittens year round and believe in quality not quantity. Our Sphynx get our full attention. We do not offer designer breeds (elf, bambino, dwelf) and often times have a small waiting list. Our next litter expected JAN 2019 please read kitten page for information or go to: KITTENS!! 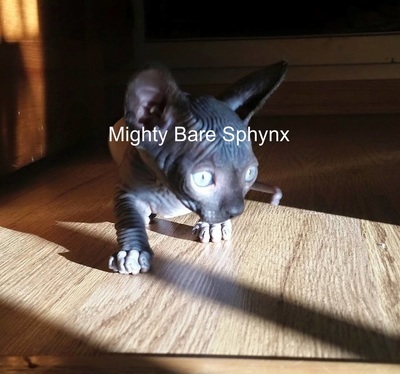 We also have Sphynx information on our "FAQS" page and fun links on our "Links" page! distributed by any means without explicit permission.